Jean-Louis Gassee has an interesting article in his Monday Note about the tradeoffs in exposing file systems in an operations system. This essentially means giving users access to view, edit, and delete individual files. We’ve all dealt with the notion of file extensions, file names, folders, having the ability to modify any of these from Windows. As we enter the Post-PC era, a key question is if exposing the file system in mobile iOS devices is necessary to penetrate the enterprise market. But as the software and OS landscape changes, will this granular level of file management still be necessary? What types of users want to see files, folders, and manage their hard drive space in such a fashion? Or will that be a thing of the past as the OS becomes more app-centric and less file-centric. …For example: Keynote doesn’t let you see the graphics, videos, and PDFs that you want to assemble into your presentation. Unlike on the Mac, there’s no Finder, no place where you can see “everything” at one glance. Even more important, there’s no natural way to combine heterogeneous documents into one. Is an exposed file system the only way to meet those needs? Here’s one way to look at it – in my mind, exposed file systems go hand-in-hand with hard disk storage management. How much space do I have left? What can I do to free up space? And this is where the complexity lies. This is an aspect of the OS I’ve always found frustrating. Perhaps I’m in the minority, but my hard disk becomes such a convoluted mess that it’s hard to get the most value out of my available space. The pie chart we’re used to from Windows that tells you how much space you are using and have available is woefully inadequate. You can’t drill down at all to understand what you have to do to optimize hard drive space. True, there are ways to find duplicate files, defragment your hard drive, and see which files are taking up the most space. But none of this is as simple as I think it could be and I don’t think has reached the mainstream. In a world of limited memory (which might end with the proliferation of cloud services), this is to critical a task not to provide a great user experience for. The iPhone, iPad, and Android devices have made progress in telling users in a more useful way how much memory they have left. 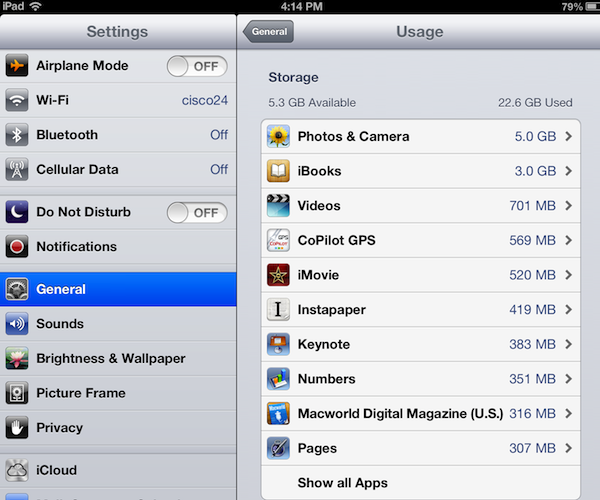 The Usage section in General Setting in iOS tells you, on an app level, how many GB of space you are using and have available. You can select an app and delete the app from this section, but you don’t have any more fine-grained control to help you manage memory. I can only see this as a built-in part of the OS and not a 3rd party app. There’s also the question of when limited disk space becomes a thing of the past. As cloud storage matures and becomes the new place we manage our files, I’d expect the inconvenience of limited disk space to go away. In conclusion, is it worth sacrificing simplicity to have an exposed file system in an OS? Is this necessary for an OS to penetrate the enterprise market? Is there an unmet need of users to manage individual files, folders, and disk space? Next post: App discovery – when will app search evolve?